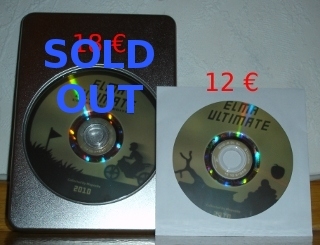 Elma Ultimate 2010 is a collection of the best Elma (and Across) stuff made since 1997. The material can be either downloaded as iso file or if you want to own a piece of Elma history of your own, you should probably order the DVD. The DVD contains also all the stuff from old Moposite, which aren't uploaded to the new Moposite yet. We offer you two versions: basic and collector's edition. The contents of them are same, just the media is fancier in collector's edition. The prices are 12 € for basic and 18 € for collector's edition. We will use the earnings as Moposite donations: for server fees and other costs. The DVD is dual layer so it might not work in all players. We verify the DVD after burning it so there shouldn't be errors but if there are (or any other problems related to the DVD) we can't really promise any return service. If things gets too complicated, we have to stop making the DVDs because of our very limited resources. Last modification: 17. Dec 2016, 14:29 UTC. Page generation in 0.0038 seconds.